Khanzadeh Gharah Shiran, M., Bakhtiari, H., Ghafari, M., Rajaee, S., MohammadNejad, M. (2018). Investigation of Standoff Distance Effect on Corrosion Behavior of Explosively Welded Joint between Two Aluminum Plates and Steel. International Journal of Iron & Steel Society of Iran, 15(1), 9-18. M. Khanzadeh Gharah Shiran; H. Bakhtiari; M. M. Ghafari; S. Rajaee; M. MohammadNejad. "Investigation of Standoff Distance Effect on Corrosion Behavior of Explosively Welded Joint between Two Aluminum Plates and Steel". International Journal of Iron & Steel Society of Iran, 15, 1, 2018, 9-18. Khanzadeh Gharah Shiran, M., Bakhtiari, H., Ghafari, M., Rajaee, S., MohammadNejad, M. (2018). 'Investigation of Standoff Distance Effect on Corrosion Behavior of Explosively Welded Joint between Two Aluminum Plates and Steel', International Journal of Iron & Steel Society of Iran, 15(1), pp. 9-18. Khanzadeh Gharah Shiran, M., Bakhtiari, H., Ghafari, M., Rajaee, S., MohammadNejad, M. Investigation of Standoff Distance Effect on Corrosion Behavior of Explosively Welded Joint between Two Aluminum Plates and Steel. 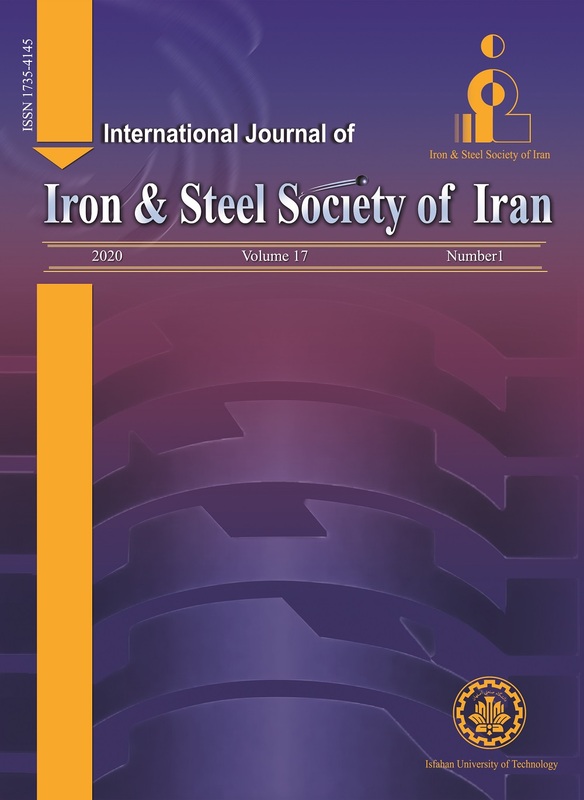 International Journal of Iron & Steel Society of Iran, 2018; 15(1): 9-18. In the present research, the effect of standoff distance on corrosion properties of the joint of three aluminum–steel explosive layers has been studied. For this purpose, the samples were welded with various standoff distance under constant explosive load. Optical Microscopy and Scanning Electron Microscopy were used to measure the quality of the joint and type of interface. Furthermore, point analysis of EDS was used to study the local and continuous welded areas. In addition, hardness test was employed to investigate the mechanics of the joints, electrochemical polarization and impedance in order to examine the corrosion behavior of various samples. Results of the microstructural investigations have suggested wavy – vortex transition of interface and formation of locally melted areas with a combination of the joined plates as a result of standoff distance and collision kinetic energy augmentation. Results indicated that changes of iron percentage rate in localized fusion areas of the interface had considerable effect on the cathodic behavior and corrosion caused by the galvanic cell of the interface. Moreover, the increase of collision kinetic energy in the interface led to a decrease in corrosion resistance in the impedance test. B. Crossland: Explosive Welding of Metals and Its Applications, Oxford University Press, New York, (1982). T. Z. Blazynski: Explosive Welding, Forming andCompaction, Applied Science Publishers, England, (1983). M. Benak, M. Turna, M. Ozvold, P. Nesvadba, J. Lokaj, L. Caplovic, F. Kovac and V. Stoyka: Roznov pod Radhostem Czech Republic, EU, (2010), 235. K. Raghukandan: J. Mater. Process. Tech., 139(2003), 573. N. Kengkla, N. Tareelap: Proc. Conf. 1stMae., Fah Luang University, Thailand, (2012). U. Kamachi Mudali, B. M. Ananda Rao, K. Shanmugam, R. Natarajan and B. Raj: J. Nucl. Mater., 321(2003), 40. M. Acarer: J. Mater. Eng. Perform., 21(2012), 2379. N. Kahraman and B. Gulenc: J. Mater. Process. Tech.,169(2005), 127. N. Kahraman and B. Gulenc: Int. J. Impact. Eng., 34(2007), 1423. H. R. Zareie Rajani, S. A. A. Akbari Mousavi and F. Madani Sani: Mater. Design., 43(2013), 467. ASTM E8M, Standard Test Methods for Tension Testing of Metallic Materials, Book of Standards, 03.01, USA, (2006). ASTM 384-11, Standard Test Method for Knoop and Vickers Hardness of Materials, Book of Standards, 03.01, USA, (2011). ASTM G1-03, Preparing, Cleaning, and Evaluating Corrosion Test Specimens, Book of Standards, (2003). M. L. Huang and L. Wang: Metall. Mater. Trans. A., 29(1998), 3037. R. V. Tamhankar and J. Ramesam: Mater. Sci. Eng.,13(1974), 245. S. A. A. Akbari Mousavi and P. FarhadiSartangi: Mater. Design., 30(2009), 459. G. H. Liaghat, S. A . Dehghan Manshadi: Modares Mechanical Engineering, 10(2010), 54. K. Hokamoto, T. Izuma, M. Fujita, M. Aoyagi: Welding Int., 6(1992), 941. S. A. A. Akbari Mousavi and S. T. S Al-Hassani: J. Mech. Phys. Solids., 53(2005), 2501. B. Gulenc: Mater. Sci. Eng., 29(2008), 275. F. Findik: Mater. Sci. Eng., 32(2011), 1081. J. Sci. Ind. Res., 51(2011), 283. S. A. Yahya and A. A. Rahim: Sains Malaysiana, 40(2011), 953. M. R. Khanzadeh Gharah Shiran, S. J. Mohammadi Baygi, S. R. Kiahoseyni, H. Bakhtiari and Allah M. Dadi: Int. J. Damage. Mech., (2016), 1.